Forget about cake mix and boxes! Once you’ve made this Devil’s Food Cake recipe from scratch, you’ll never go back. It’s simply the moistest and tastiest! You guys, I think I just outdid myself! I just made the most spectacular chocolate cake of all times, and I do mean SPECTACULAR. I’m not exaggerating, not even one bit. 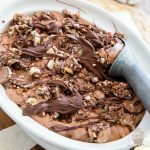 If you’re seriously into chocolate, just you wait until you get to feast your eyes on this bad boy; It’ll totally sweep you off your feet. I honestly can’t wait to show it to you! BUT, no matter how excited I am, I decided that it would probably be best if I shared the recipe in 3 distinct posts: one for the Devil’s Food Cake, one for the [mother of all] Chocolate Fudge Frosting that covered it, and finally, one for the actual assembly of the final project. Why, you ask? Why torture you like that? Well, first and foremost, that cake is what I would call a true weekend project. 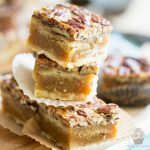 I figured that if I were to share the entire recipe and assembly instructions in one single post, it would take you so long to read it, you’d probably get discouraged and wouldn’t even want to try your hand at replicating that beautiful cake. That, would be a total shame. But also too, I like to keep things compartmentalized and well organized, you see? I thought that by making this a 3 part project, it would make it easier to find, reference or index just one of the recipes later down the road. After all, you might eventually be tempted to make the Devil’s Food Cake but try and cover it with all kinds of different varieties of frosting, which you totally should by the way, because this cake is really THE BOMB! 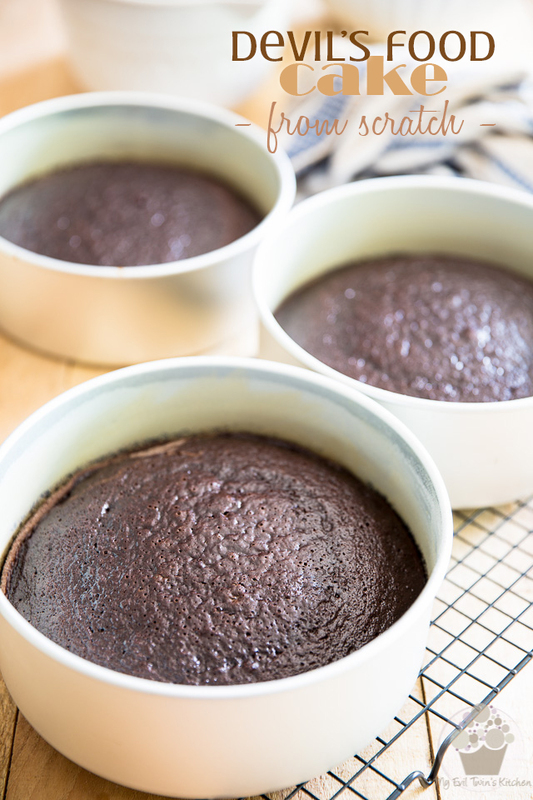 Trust me, I am absolutely convinced that once you’ve made this Devil’s Food Cake, you’re never, EVER going to be using boxes or cake mix anymore. This “from scratch” cake is practically just as easy to make, only it’s a million times better. 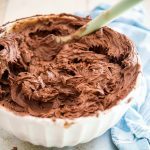 It’s incredibly moist and tender, and it totally fills your mouth with all kinds of rich and intense dark chocolate aromas. I swear, this is now my official go-to chocolate cake recipe, and I’m absolutely positive that it’ll become yours, too. The first thing you want to do is preheat your oven to 350°F; also, grease and flour three 8″ round cake pans. Hold each pan upside down and knock it gently against the counter a few times to remove any excess flour. Set aside. 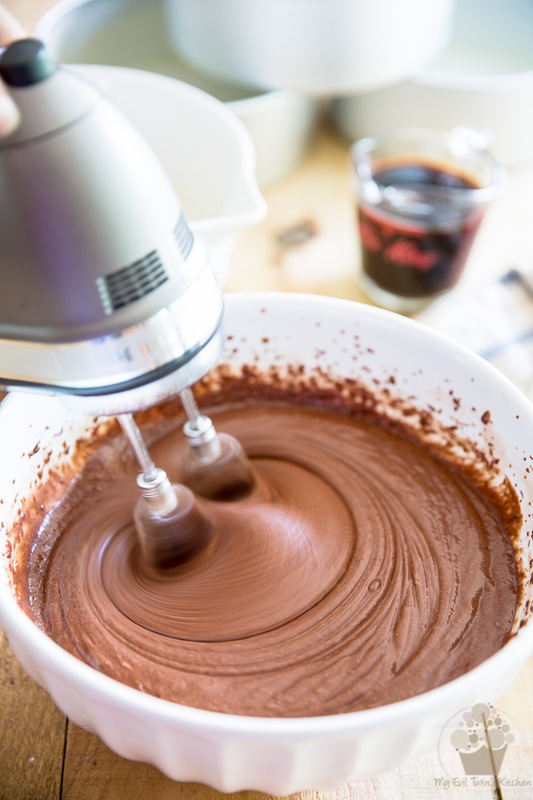 Next up, you’ll want to sift the flour, cocoa powder, baking soda and baking powder into a large mixing bowl. 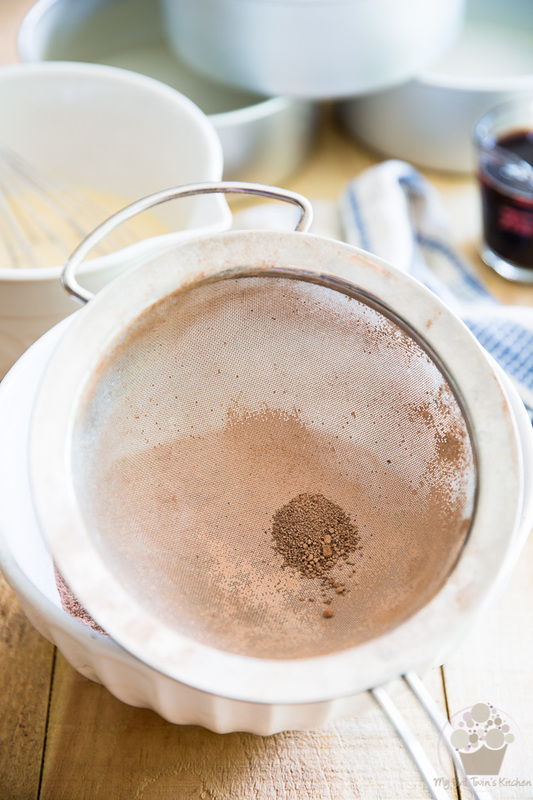 Once your cocoa powder and flour (and baking powder and baking soda, too) have been sifted, add the sugar and salt to the bowl and mix well with a flat whisk until all the ingredients are well combined. 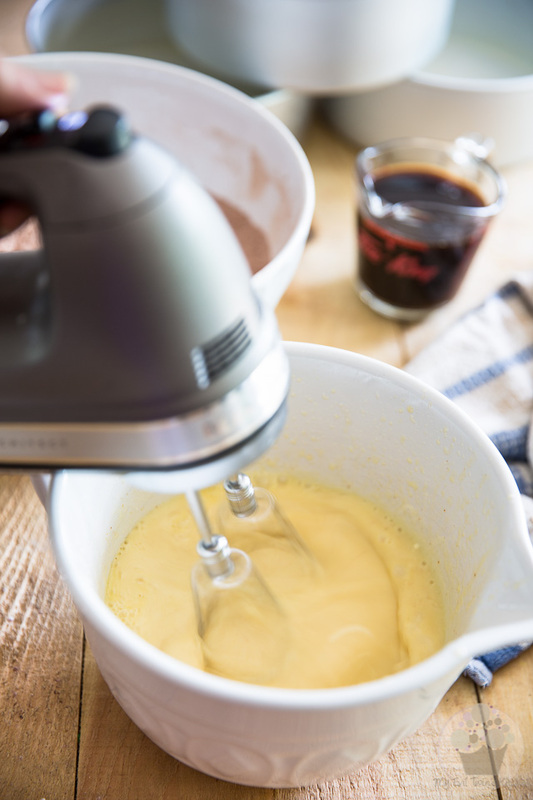 In a separate bowl, combine the buttermilk, melted ghee and eggs and beat with an electric mixer on medium speed until well combined. You could also use oil instead of ghee if that’s all you had on hand or if it was more convenient for you. However, I don’t recommend that you use butter because of its additional moisture content, which would affect the final texture of the cake. You really want to stick to pure fat. …and mix until well combined, about 2 minutes. About the instant coffee, it’s not absolutely mandatory that you use it, but I strongly recommend that you do. 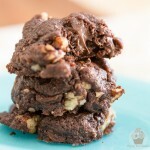 It won’t confer any of its flavor to the batter, but rather will greatly deepen the flavor of the chocolate, making your cake EXPLODE with a crazy rich and intense chocolate flavor. Resume beating with the mixer on medium speed until all the ingredients are well combined. 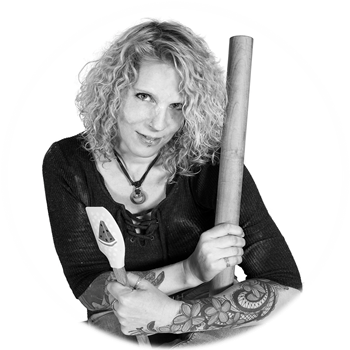 Stop to scrape the bottom of the bowl with a rubber spatula once or twice. 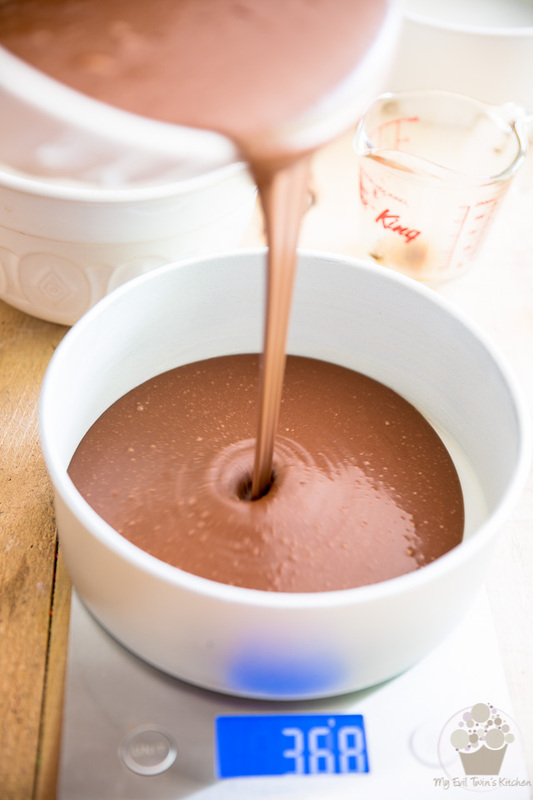 Pour the finished cake batter into the prepared pans. If you have a kitchen scale, I strongly suggest that you weigh your batter as you pour it into the pans. 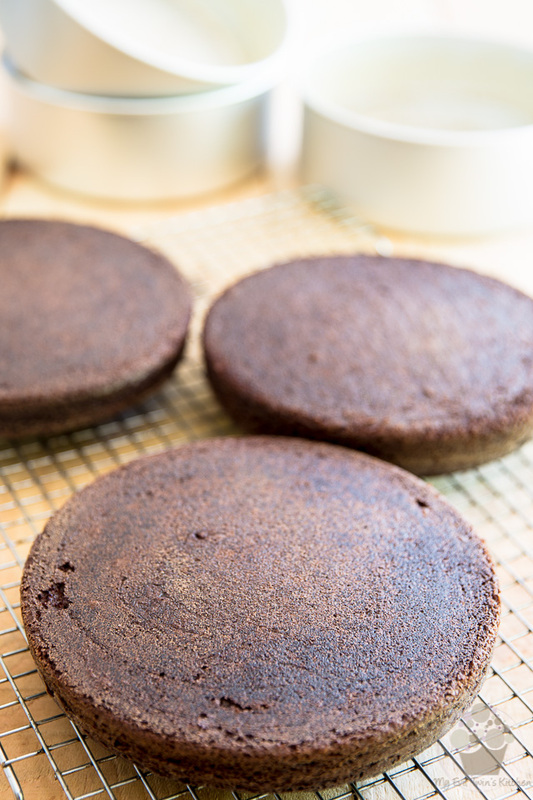 While you could very well eyeball it, using a scale is the best way to ensure that your cake layers are exactly even. You should be looking at around 545g (19.2oz) of batter per pan. Bake your cakes for 25 to 30 minutes, or until a toothpick inserted in the center comes out clean. When fully baked, let the cakes cool in the pans for 25 to 30 minutes. 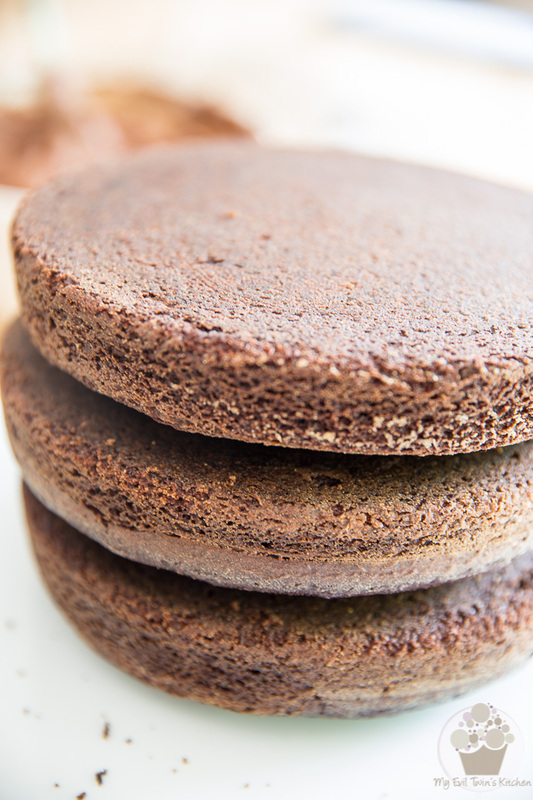 Delicately remove the cakes from the pans and turn them onto a cooling rack, and then place them in the refrigerator to cool completely before frosting. Speaking of frosting… here’s is a little teaser for ya, a little glimpse at what comes next! Does that frosting look amazing or what? I think it truly is the mother of all chocolate fudge frosting. Stay tuned for that recipe! I won’t keep you waiting too long, don’t worry. Just a few days, promise. You can make the cakes while you wait! Preheat the oven to 350°F; grease and flour three 8" round cake pans. Hold each pan upside down and knock it gently against the counter a few times to remove any excess flour. Set aside. 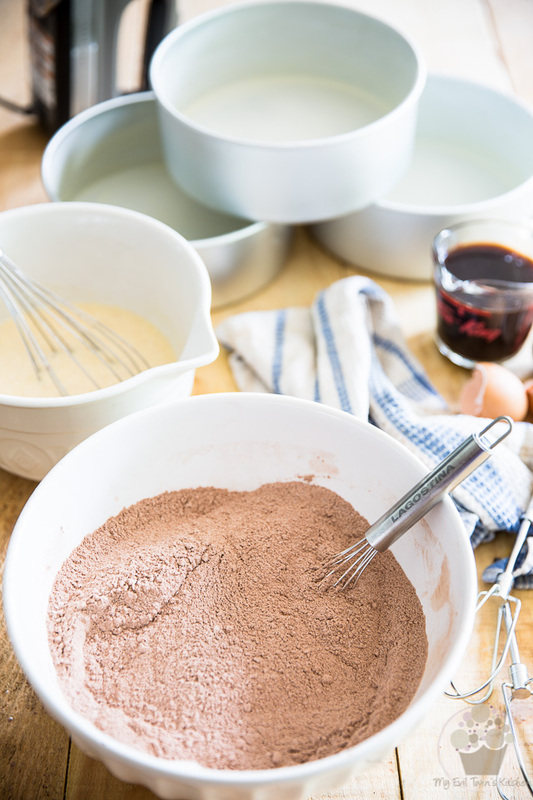 Sift the flour, cocoa powder, baking soda and baking powder into a large mixing bowl. 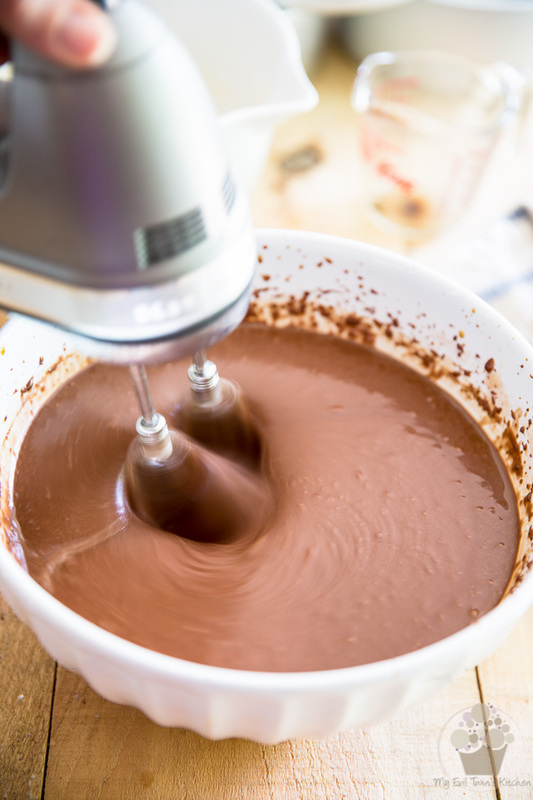 Add the sugar and salt and mix well with a flat whisk until all the ingredients are well combined. 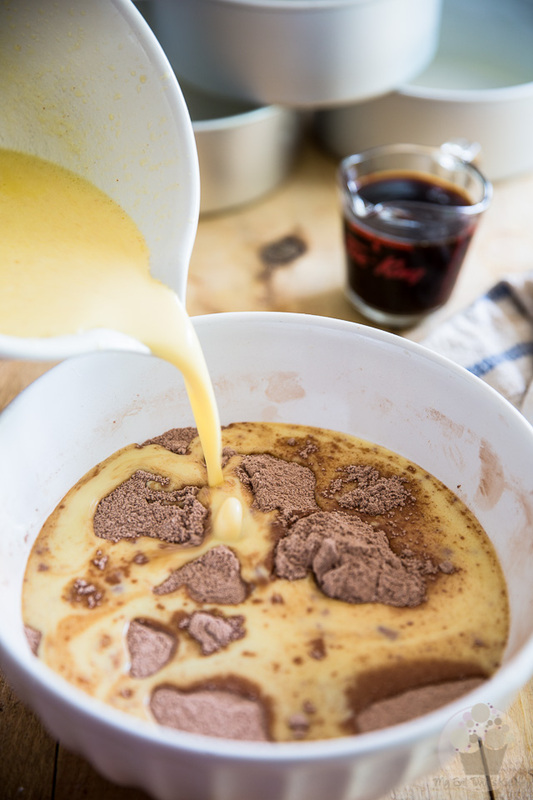 In a separate bowl, combine the buttermilk, melted ghee (or oil) and eggs and beat with an electric mixer on medium speed until well combined. Slowly add the wet ingredients to the dry and mix until well combined, about 2 minutes. Dilute the instant coffee in the boiling water and add the vanilla. 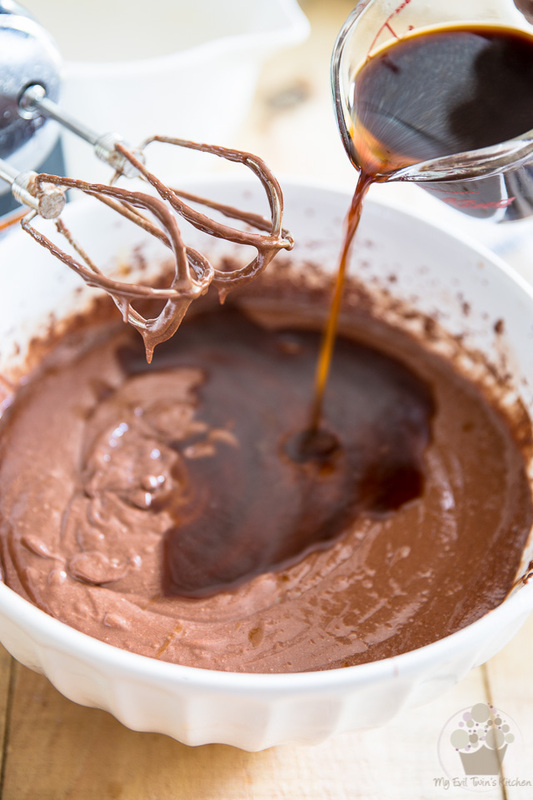 Pour that right into the cake batter and beat with the mixer on medium speed until well combined, scraping the bottom of the bowl with a rubber spatula once or twice. 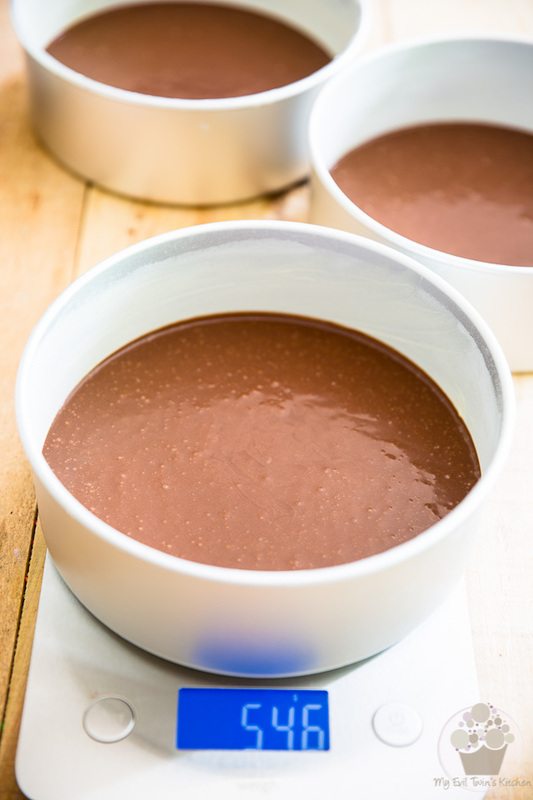 Pour the batter into the prepared pans (you should get about 545g | 19.2oz per pan) and bake for 25 to 30 minutes, or until a toothpick inserted in the center comes out clean. 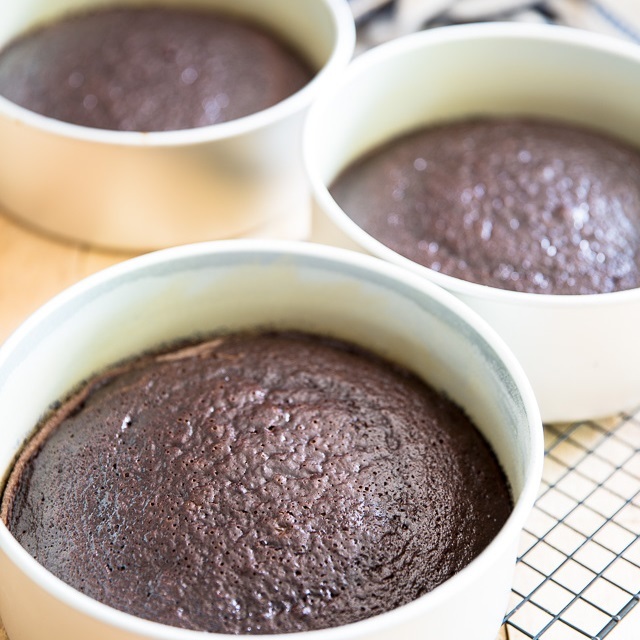 Cool the cakes in the pans for 25 to 30 minutes, then delicately turn them onto a cooling rack and place in the refrigerator to cool completely before frosting. Hi dear ,I tried this recipe of urs ..just need to ask some questions …I don’t know y my cake just turns flat after frosting it wasn’t looking tall infact more of a round shape n I didn’t have same ganache drizzling effect like urs …I have followed every single step u have explained ..
Hi! I’m going to make your Wicked Windmill cake for Thanksgicing and plan on making the Devils Food cakes on Friday and freezing them until Wednesday. I purchased the Ghee you linked – this will be my first time using it – )92 do I melt Ghee for the recipe? In the microwave or in a pot? Help please :). Thanks! Ghee is pretty much the same as butter, the only difference being that it has been rid of all the moisture, so all that’s left behind is the fat. You can melt it in the microwave or in a pot, just like you would butter. Just use whichever method you prefer! Good luck with the Windmill, can’t wait to hear how it turned out! Can I just use Butter instead of ghee? I wouldn’t recommend it… if you can’t use ghee, go with oil instead. 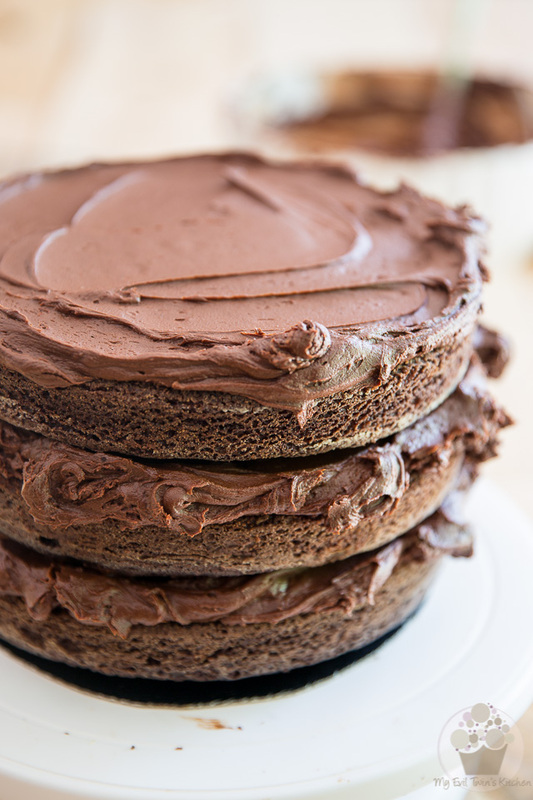 I plan to make the Nutella cake for my sons bday but it needs to be gf…I have Pamela’s Artisan flour mix, some gf cakes call for extra fiat or xanthum gum…what would you think? I can’t wait to make this! I honestly have no idea, Holly… I’ve never worked with gluten free flours. Sorry I can’t be of more help!